Are you ready? 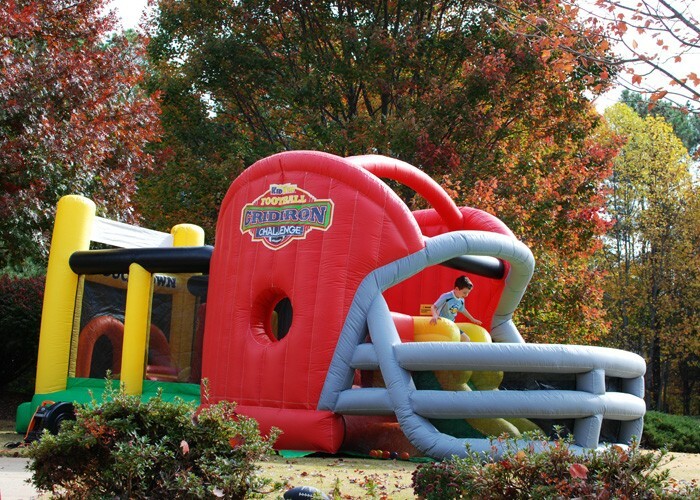 If you are a football fan, this commercial moonwalk obstacle bounce house is a great item to have in your rental inventory. This commercial grade bouncer is made of heavy duty 18 oz material. The Gameday Bouncer is perfect for outdoor and indoor events, rentals, parties, schools and booster clubs. The Gridiron Football Challenge comes in several Helmet Color choices to match the most popular team colors. Stock colors are Red, Blue, Orange, Black and Purple and includes fun football graphics both inside and out. A white banner is also included that can be used to print custom logos or themes at your local print source. The unique patent pending design integrates the theme of a Football Helmet bouncer with an obstacle entrance, plus a slide and play area that also can be used as a ball pit. This bouncer is recommended for kids 4-12 years of age.